A lot of people will be unfamiliar with the term dependent-contractors. Conversely, many will be familiar with the term independent-contractor. These terms typically come up in the employment context, and if you run a business where this is the case, you’ll definitely want to keep reading. One of the most significant errors a business owner can make is to misclassify a worker as an independent-contractor. There are many repercussions to making this misclassification, like being held liable by the Canada Revenue Agency (CRA) for all the statutory deductions that you should have made from the worker’s earnings. Many business owners are surprised to discover that a middle ground exists between the categories of employee and independent-contractor: that of, dependent-contractor. This is where a worker is not classified by the business as an employee, but where there is a sufficient degree of economic dependency by them on a particular client. In making an assessment as to whether a worker fits into the dependent-contractor category, you’ll need to consider the issue of exclusivity: that is, if the worker relies heavily on a single client for a prolonged period of time, this typically indicates the existence of a dependent-contractor. 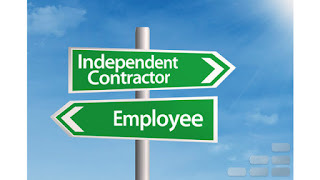 The legal differences between an independent-contractor and a dependent-contractor are complicated and tricky, but one main area of difference is the notice due to the worker upon termination. Unlike an independent-contractor, a dependent-contractor is entitled to reasonable notice of their termination, just like a regular employee would be entitled to. If the business owner fails to provide the dependent-contractor with sufficient notice, they may be liable in damages in lieu of notice. If this still isn’t making a lot of sense to you, this case study may help you understand the difference. The Ontario Superior Court made a landmark decision on this issue in the case of Keenan v. Canac Kitchens. That case involved two workers who worked for Canac; one was employed for 33 years (Plaintiff A) and the other for 26 years (Plaintiff B). For the first 11 years of Plaintiff A’s tenure, and the first 4 years of Plaintiff B’s tenure, they were categorized as employees for all legal and practical purposes. For part of that time, the two were employed by Canac as foremen. This ended when Canac decided to change the employment arrangement it had with the two Plaintiffs. The new arrangement imposed an obligation on the Plaintiffs to pay the workers who performed the kitchen cabinet installations, and also required that the Plaintiffs provide said workers with some of their own equipment. In furtherance of this new arrangement, Canac suggested that the Plaintiffs incorporate a business through which they could provide the kitchen installation services. However, the Plaintiffs never did. In fact, after the new arrangement came into effect, the Plaintiffs were permitted by Canac to work for a competing company, and the Plaintiffs did so, in fact, work for that competitor. So far, the above scenario seems to suggest the presence of an independent-contractor relationship between Canac and the Plaintiffs. This was the position taken by Canac at trial, and therefore, when Canac began experience financial difficulties and needed to offload manpower costs, they did not provide the Plaintiffs with the adequate amount of notice before terminating them. Canac was of the opinion that the Plaintiffs were not entitled to any notice because of their classification as independent-contractors. The court disagreed with Canac, and instead made a finding that the Plaintiffs were dependent-contractors. This is despite the existence of several factors that pointed in the direction of independent-contract classification, like how the Plaintiffs worked for a rival company. The court held that the Plaintiffs worked primarily for Canac, and most of the earnings made by the Plaintiffs were from earnings they made from their work for Canac. The court interpreted the relationship between the Plaintiffs and Canac as one of dependence and reliance, and as such, ruled that the Plaintiffs were entitled to reasonable notice of termination. So the takeaway from the above case study is that whether or not a worker primarily works for a single client is a determining factor when it comes to deciding whether a worker is entitled to reasonable notice of termination. The main thing is to remember that even if other factors indicate the existence of an independent-contract status, if the worker is working mostly for one client, then they’re entitled to reasonable notice of termination.